GENERAL DIRECTIONS: PREHEAT OVEN TO 350 DEGREES. MIX BROWNIE MIX (MARKED 17) AND A PACKET MARKED "CD" WITH 6 TABLESPOONS MELTED BUTTER, 2 EGGS AND 1 TEASPOON VANILLA IN A MIXING BOWL. STIR UNTIL BLENDED. POUR INTO A GREASED 8X8-INCH BAKING PAN. 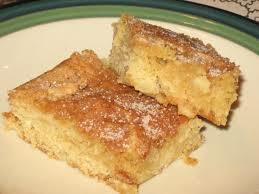 BAKE 20-25 MINUTES OR UNTIL BROWNIES BEGIN TO PULL AWAY FROM SIDES OF PAN. DO NOT OVER BAKE. 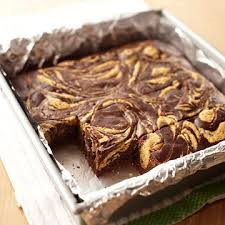 AFTER BROWNIE HAS COOLED, MIX FUDGE PACKAGE (MARKED-31) AND THE REMAINING 2 PACKETS (CD & BU) WITH 2 TABLESPOONS MELTED BUTTER, 1 TEASPOON VANILLA, 2 TABLESPOONS MILK PLUS 1 TEASPOON OF MILK IN A BOWL. STIR UNTIL THICK AND SMOOTH. SPREAD ON BROWNIE. Brownies are a simple favorite in the kitchen. 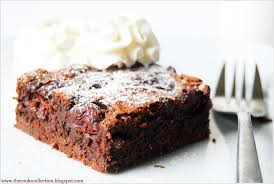 Make it a yummy favorite with our superb Black Forest Brownie Mix. Black Forest brownies truly unbeatable, extra chocolate and cherries mixed in delicious brownies to put you in a state of wonder. INGREDIENTS: SUGAR, UNBLEACHED WHEAT FLOUR (WHEAT FLOUR, MALTED BARLEY FLOUR, NIACIN, IRON, THIAMIN MONONITRATE, RIBOFLAVIN, FOLIC ACID), COCOA, CORNSTARCH, DRIED CHERRIES (RED TART CHERRIES, SUGAR) AND NATURAL AND ARTIFICIAL FLAVORING. What a fantastic brownie. Gooey brownie and caramel fudge icing. What could be better! INGREDIENTS: SUGAR, UNBLEACHED WHEAT FLOUR (WHEAT FLOUR, MALTED BARLEY FLOUR, NIACIN, IRON, THIAMIN MONONITRATE, RIBOFLAVIN, FOLIC ACID), COCOA, CORNSTARCH, NATURAL FLAVOR AND SALT. 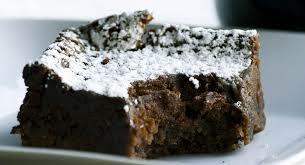 Indulge in our delicious brownie with rich coffee flavor and an extra touch of powdered sugar on top. 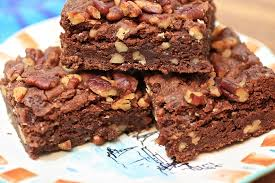 Rabbit Creek gourmet brownies are simply the finest! Gourmet Brownies. INGREDIENTS: SUGAR, UNBLEACHED WHEAT FLOUR (WHEAT FLOUR, MALTED BARLEY FLOUR, NIACIN, IRON, THIAMIN MONONITRATE, RIBOFLAVIN, FOLIC ACID), COCOA, COFFEE CRYSTALS AND CORNSTARCH. What better flavor?!? 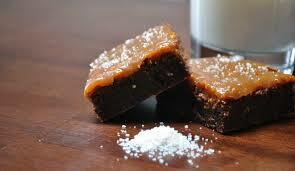 Caramel flavoring with apple nuggets all in our delicious chocolate brownie mix. Everybody will rave over this delightful dessert! INGREDIENTS: SUGAR, UNBLEACHED WHEAT FLOUR (WHEAT FLOUR, MALTED BARLEY FLOUR, NIACIN, IRON, THIAMIN MONONITRATE, RIBOFLAVIN, FOLIC ACID), COCOA, DRIED APPLES AND NATURAL FLAVORING. And it even tastes better than it looks!!! 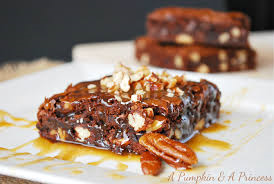 Toffee and pecans to top off this delectable brownie, what a delicious blend of ingredients. INGREDIENTS: SUGAR, UNBLEACHED WHEAT FLOUR (WHEAT FLOUR, MALTED BARLEY FLOUR, NIACIN, IRON, THIAMIN MONONITRATE, RIBOFLAVIN, FOLIC ACID), COCOA, PECANS, AND ENGLISH TOFFEE ((SUGAR, BROWN SUGAR, GLUCOSE, MARGARINE (LIQUID AND PARTIALLY HYDROGENATED SOYBEAN OIL, WATER, SALT, WHEY SOLIDS, SOY LECITHIN, VEGETABEL MONO & DIGLYCERIDES, SODIUM BENZOATE (A PRESERVATIVE), NATURAL & ARTIFICIAL FLAVORS, BETA CAROTENE (COLOR), VITAMIN A PALMITATE ADDED), PARTIALLY HYDROGENATED COTTONSEED OIL, SALT, LECITHIN, MAY CONTAIN TRACE AMOUNTS OF ALMONDS, PECANS, CASHEWS, PEANUTS, MACADAMIAS)). CONTAINS WHEAT, SOY, MILK, AND TREE NUTS (PECANS) INGREDIENTS. 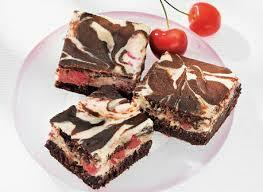 Our cherry cheesecake brownie mix is full of cherry dices and cream cheese to swirl through this delicious chocolate brownies. INGREDIENTS: SUGAR, UNBLEACHED WHEAT FLOUR (WHEAT FLOUR, MALTED BARLEY FLOUR, NIACIN, IRON, THIAMIN MONONITRATE, RIBOFLAVIN, FOLIC ACID), COCOA, CREAM CHEESE SEASONING ((CREAM CHEESE POWDER (CREAM CHEESE [PASTEURIZED MILK, CHEESE CULTURE, SALT, CAROB BEAN GUM], NONFAT MILK, CULTURED CREAM, SODIUM CASEINATE, LACTIC ACID, CITRIC ACID, DISODIUM PHOSPHATE, NATURAL FLAVORS, BHA), SUGAR, FRUCTOSE, MODIFIED FOOD STARCH, CITRIC ACID, NATURAL FLAVOR, GUAR GUM, AND LACTIC ACID, LESS THAN 2% SILICON DIOXIDE ADDED TO PREVENT CAKING)), DRIED CHERRIES AND NATRUAL & ARTIFICIAL FLAVORING. 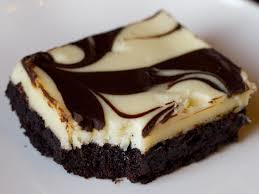 Swirl some of our wonderful cream cheese into our chocolate brownie mix. This is the perfect mixture of rich cheesecake flavor that cuts perfectly into our flavorful chocolate. Once you have a bite, you'll need another! 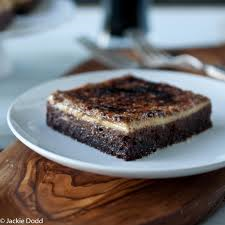 INGREDIENTS: SUGAR, UNBLEACHED WHEAT FLOUR (WHEAT FLOUR, MALTED BARLEY FLOUR, NIACIN, IRON, THIAMIN MONONITRATE, RIBOFLAVIN, FOLIC ACID), COCOA, CREAM CHEESE SEASONING ((CREAM CHEESE POWDER (CREAM CHEESE [PASTEURIZED MILK, CHEESE CULTURE, SALT, CAROB BEAN GUM], NONFAT MILK, CULTURED CREAM, SODIUM CASEINATE, LACTIC ACID, CITRIC ACID, DISODIUM PHOSPHATE, NATURAL FLAVORS, BHA), SUGAR, FRUCTOSE, MODIFIED FOOD STARCH, CITRIC ACID, NATURAL FLAVOR, GUAR GUM, AND LACTIC ACID, LESS THAN 2% SILICON DIOXIDE ADDED TO PREVENT CAKING)). 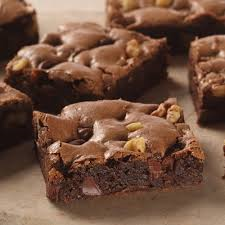 If you are a chocolate lover this brownie will definitely take yo to ecstasy!! One bite of this delicious brownie and you won't be able to stop. INGREDIENTS: SUGAR, UNBLEACHED WHEAT FLOUR (WHEAT FLOUR, MALTED BARLEY FLOUR, NIACIN, IRON, THIAMIN MONONITRATE, RIBOFLAVIN, FOLIC ACID), COCOA, PEANUT BUTTER CHIPS ((PARTIALLY DEFATTED PEANUTS, SUGAR, PARTIALLY HYDROGENATED VEGETABLE OIL (PALM KERNEL AND SOYBEAN OIL), CORN SYRUP SOLIDS, DEXTROSE, REDUCED MINERALS WHEY (MILK), CONTAINS 2% OR LESS OF: SALT, VANILLIN, ARTIFICIAL FLAVOR, SOY LECITHIN)), WHITE CONFECTIONERY BAKING CHIPS (SUGAR, PALM KERNEL OIL, NONFAT MILK POWDER, WHOLE MILK POWDER, WHEY POWDER, PALM OIL, SOY LECITHIN (AN EMULSIFIER) AND VANILLA), AND CHOCOLATE CHIPS (CHOCOLATE LIQUOR, SUGAR, SOY LECITHIN (ADDED AS AN EMULSIFIER), VANILLIN (ARTIFICIAL FLAVORING)) AND PECANS. CONTAINS WHEAT, SOY, PEANUT, TREE NUTS (PECANS) AND MILK INGREDIENTS. Not a significant source of trans fats. 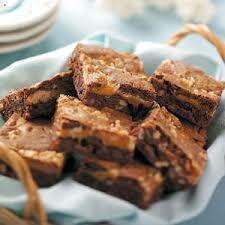 This is our delicious tasting chocolate brownie with yummy peanut butter chips. It is the perfect mix that will have your mouth watering before every bite. INGREDIENTS: SUGAR, UNBLEACHED WHEAT FLOUR (WHEAT FLOUR, MALTED BARLEY FLOUR, NIACIN, IRON, THIAMIN MONONITRATE, RIBOFLAVIN, FOLIC ACID), COCOA AND PEANUT BUTTER CHIPS ((PARTIALLY DEFATTED PEANUTS, SUGAR, PARTIALLY HYDROGENATED VEGETABLE OIL (PALM KERNEL AND SOYBEAN OIL), CORN SYRUP SOLIDS, DEXTROSE, REDUCED MINERALS WHEY (MILK), CONTAINS 2% OR LESS OF: SALT, VANILLIN, ARTIFICIAL FLAVOR, SOY LECITHIN)), AND NATURAL & ARTIFICIAL FLAVOR. One of our top sellers and you'll know why after one bite. 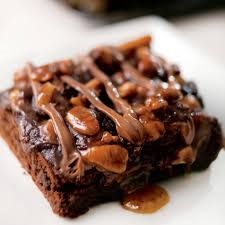 This brownie has a wonderful caramel flavor and is topped off with an incredible toffee crunch. YUMMY! COTTONSEED OIL, SALT, LECITHIN, MAY CONTAIN TRACE AMOUNTS OF ALMONDS, PECANS, CASHEWS, PEANUTS, MACADAMIAS)) AND NATURAL FLAVORING. Our number one selling product!!!! Killer mudd is our delicious chocolate brownie mix loaded with chocolate chips. We dare you to try it and see why our customers can't get enough. Another top seller!! This amazing chocolate brownie mix comes with white chocolate, peanut butter and chocolate chips. The mixture of these ingredients has a million dollar taste. INGREDIENTS: SUGAR, UNBLEACHED WHEAT FLOUR (WHEAT FLOUR, MALTED BARLEY FLOUR, NIACIN, IRON, THIAMIN MONONITRATE, RIBOFLAVIN, FOLIC ACID), COCOA, WHITE CONFECTIONERY BAKING CHIPS (SUGAR, PALM KERNEL OIL, NONFAT MILK POWDER, WHOLE MILK POWDER, WHEY POWDER, PALM OIL, SOY LECITHIN (AN EMULSIFIER) AND VANILLA), PEANUT BUTTER CHIPS ((PARTIALLY DEFATTED PEANUTS, SUGAR, PARTIALLY HYDROGENATED VEGETABLE OIL (PALM KERNEL AND SOYBEAN OIL), CORN SYRUP SOLIDS, DEXTROSE, REDUCED MINERALS WHEY (MILK), CONTAINS 2% OR LESS OF: SALT, VANILLIN, ARTIFICIAL FLAVOR, SOY LECITHIN)) AND CHOCOLATE CHIPS (CHOCOLATE LIQUOR, SUGAR, SOY LECITHIN (ADDED AS AN EMULSIFIER), VANILLIN (ARTIFICIAL FLAVORING)). Chocolate on chocolate!!! 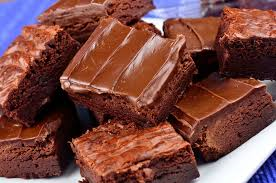 Chocolate lovers every where go crazy for this delicious brownie mix. It's simply a chocolate brownie mix that comes with a delicious chocolate fudge icing. INGREDIENTS: SUGAR, UNBLEACHED WHEAT FLOUR (WHEAT FLOUR, MALTED BARLEY FLOUR, NIACIN, IRON, THIAMIN MONONITRATE, RIBOFLAVIN, FOLIC ACID),COCOA, CORNSTARCH AND SALT. Chocolate, caramel and powdered sugar. What a delight for the tast buds! INGREDIENTS: SUGAR, UNBLEACHED WHEAT FLOUR (WHEAT FLOUR, MALTED BARLEY FLOUR, NIACIN, IRON, THIAMIN MONONITRATE, RIBOFLAVIN, FOLIC ACID), COCOA, COFFEE, NATURAL FLAVORING AND CORNSTARCH. 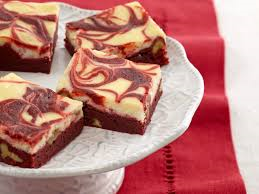 It tastes just like crisp raspberry cheesecake, only in a brownie! 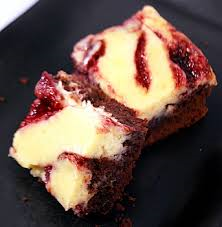 Raspberry nuggets and cream cheese swirl through this delicious chocolate brownie. GUM, AND LACTIC ACID, LESS THAN 2% SILICON DIOXIDE ADDED TO PREVENT CAKING)), RASPBERRY NUGGETS ((APPLES, CITRIC ACID, MALIC ACID, NATURAL FLAVORS, ARTIFICIAL COLORS (RED #40 & BLUE #1)) AND NATURAL AND ARTIFICIAL FLAVORING. FLAVORS, BHA), SUGAR, FRUCTOSE, MODIFIED FOOD STARCH, CITRIC ACID, NATURAL FLAVOR, GUAR GUM, AND LACTIC ACID, LESS THAN 2% SILICON DIOXIDE ADDED TO PREVENT CAKING)). 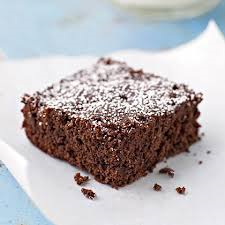 A great brownie - salty and sweet! CONTAINS WHEAT, SOY, & MILK INGREDIENTS. 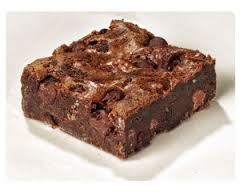 OMG is the best way to describe this amazing brownie! 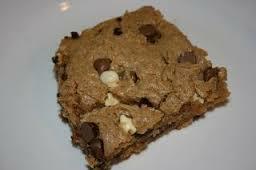 This brownie comes with white chocolate, peanut butter, chocolate chips and even fudge!! Not only is your kitchen going to be filled with the wonderful scent of these ingredients your family's tummies will also be full! INGREDIENTS: SUGAR, UNBLEACHED WHEAT FLOUR (WHEAT FLOUR, MALTED BARLEY FLOUR, NIACIN, IRON, THIAMIN MONONITRATE, RIBOFLAVIN, FOLIC ACID), COCOA, CORNSTARCH, WHITE CONFECTIONERY BAKING CHIPS (SUGAR, PALM KERNEL OIL, NONFAT MILK POWDER, WHOLE MILK POWDER, WHEY POWDER, PALM OIL, SOY LECITHIN (AN EMULSIFIER) AND VANILLA), PEANUT BUTTER CHIPS ((PARTIALLY DEFATTED PEANUTS, SUGAR, PARTIALLY HYDROGENATED VEGETABLE OIL (PALM KERNEL AND SOYBEAN OIL), CORN SYRUP SOLIDS, DEXTROSE, REDUCED MINERALS WHEY (MILK), CONTAINS 2% OR LESS OF: SALT, VANILLIN, ARTIFICIAL FLAVOR, SOY LECITHIN)) AND CHOCOLATE CHIPS (CHOCOLATE LIQUOR, SUGAR, SOY LECITHIN (ADDED AS AN EMULSIFIER), VANILLIN (ARTIFICIAL FLAVORING)) AND SALT. CONTAINS WHEAT, SOY, PEANUT & MILK INGREDIENTS. 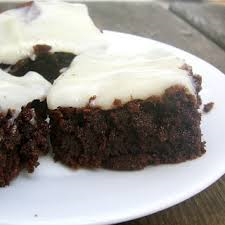 Triple chocolate with cream cheese icing brownies are rich chocolate brownies with a decadent cream cheese icing. Perfect for those who love chocolate!! INGREDIENTS: SUGAR, UNBLEACHED WHEAT FLOUR (WHEAT FLOUR, MALTED BARLEY FLOUR, NIACIN, IRON, THIAMIN MONONITRATE, RIBOFLAVIN, FOLIC ACID), COCOA, CREAM CHEESE SEASONING ((CREAM CHEESE POWDER (CREAM CHEESE [PASTEURIZED MILK, CHEESE CULTURE, SALT, CAROB BEAN GUM], NONFAT MILK, CULTURED CREAM, SODIUM CASEINATE, LACTIC ACID, CITRIC ACID, DISODIUM PHOSPHATE, NATURAL FLAVORS, BHA), SUGAR, FRUCTOSE, MODIFIED FOOD STARCH, CITRIC ACID, NATURAL FLAVOR, GUAR GUM, AND LACTIC ACID, LESS THAN 2% SILICON DIOXIDE ADDED TO PREVENT CAKING)),CHOCOLATE CHIPS (CHOCOLATE LIQUOR, SUGAR, SOYA LECITHIN [ADDED AS AN EMULSIFIER] AND VANILLIN [AN ARTIFICIAL FLAVORING]), AND CORNSTARCH. This is our yummy chocolate brownie mix overflowing with toffee and pecans. These are truly delicious and will make for the perfect dessert!! INGREDIENTS: SUGAR, UNBLEACHED WHEAT FLOUR (WHEAT FLOUR, MALTED BARLEY FLOUR, NIACIN, IRON, THIAMIN MONONITRATE, RIBOFLAVIN, FOLIC ACID), COCOA, ENGLISH TOFFEE ((SUGAR, BROWN SUGAR, GLUCOSE, MARGARINE (LIQUID AND PARTIALLY HYDROGENATED SOYBEAN OIL, WATER, SALT, WHEY SOLIDS, SOY LECITHIN, VEGETABEL MONO & DIGLYCERIDES, SODIUM BENZOATE (A PRESERVATIVE), NATURAL & ARTIFICIAL FLAVORS, BETA CAROTENE (COLOR), VITAMIN A PALMITATE ADDED), PARTIALLY HYDROGENATED COTTONSEED OIL, SALT, LECITHIN, MAY CONTAIN TRACE AMOUNTS OF ALMONDS, PECANS, CASHEWS, PEANUTS, MACADAMIAS)), PECANS AND NATURAL FLAVORING. CONTAINS WHEAT, MILK, SOY AND TREE NUTS (PECANS) INGREDIENTS.